Set in the world of Judge Dredd, Preacher Cain is Missionary Man, a former Tex City Judge who decided to spread justice and the word of god in the ruins of the Cursed Earth, the radioactive land outside of the Mega Cities. Picking up a mutie sidekick, Resurrection Joe, our bible-thumpin’, gun-totin’, cigar chompin’, hero faces his greatest foe, the demonic Legion, in an epic fight between god’s messenger and the devil’s champion. I read this originally in the 2000AD Judge Dredd Megazines back when I was starting high school and I didn’t know the name Frank Quitely but I knew I loved the art of this comic. Reading it again in this collected edition nearly 20 years later, I’m surprised by how much I can clearly recall about this comic - so many panels and pages are exactly as I remember, that’s how much of a memorable artist Quitely is! And while I would read the Hondo City strips featuring his art shortly after this, it would be years before I encountered his work again in books like Flex Mentallo, New X-Men, and All Star Superman, which would make me a huge Quitely fan. The book is made up of several short comics, as is the format of 2000AD stories, though the Bad Moon Rising storyline is feature length and is the whole reason for picking this up. A monstrous mutant experiment called Legion falls to the Cursed Earth and begins recruiting devilish raptor-esque creatures called gila-munjas and an army of cut-throats to take down the Missionary Man. Legion’s a great monster made all the more unpleasant by Quitely’s art - he’s a large, greyish hulk with pointed ears and fingers, beady eyes and a massive mouth of teeth. Frank Quitely though… the art in this story is jaw-droppingly good especially when you realise how young he was when he did this (around 25 years old). Besides the amazing character designs, I love the look he gives the Cursed Earth - bright yellow lands, purple skies, with the barest of architecture. One memorable scene (among so many) depicts a lone church - nothing else around it - with the purple sky, yellow land, and skull-moon as dozens of murderers descend, zombie-like, towards our heroes. The way Quitely draws the comic makes it look surreal, almost Kafka-esque at times and perfectly suits the unsettling, horrific nature of the story. I won’t say anything more about Quitely - his art in this book, as it is in everything he does, is simply astonishing. If I’m talking too much about Quitely, it’s because he’s the whole reason this book works so well. Gordon Rennie’s a decent writer and I didn’t read this thinking it was badly written, but I felt like anyone could’ve written this. Honestly, as much as I like Cain, he’s essentially Dredd and about 90% of his dialogue is made up of bible quotes so it doesn’t feel like this was the hardest book to write. Point Cain and Joe towards some villainous muties and watch Cain cut ‘em down! Though I do think it’s amazing how well a western works in the Dredd universe. There are some weird moments in the storytelling - Cain doesn’t seem able to die. In one scene he’s crushed by falling rocks and then moments later appears alive and unscathed with no explanation as to why. In another, he’s shot multiple times but lives, again with no explanation. Maybe Rennie wrote Cain’s character to be supernatural in some way - god’s messenger can’t die, or Cain, like the biblical Cain, can never die? I don’t know but it definitely stands out as a couple of odd moments in the book. Nostalgia definitely clouds any other flaws with the book - especially in the way the last story serves a prologue to a story we never see, though Simon Davis’ art is always a pleasure - but the intensely memorable imagery and strong western/horror story stand out as unequivocal positives to this comic. 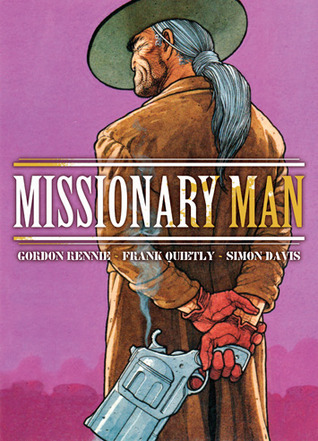 If you love Frank Quitely’s art as much as me, or just want to read one of the better 2000AD collections out there, you need to check out Missionary Man. Fun 2000AD western, mostly bought this for the art and wasn't disappointed but the writing was fun too. This is the kind of story I call stupid but fun. Plot is at bare minimum, episodes drawn by Frank Quitely show his tremondeus skill and... that's all.